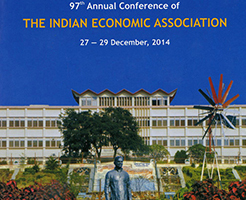 We extend our best wishes to the faculty and staff of the Department of Economics at Mohanlal Sukhadia University, Udaipur for organizing the 97th Annual Conference of The Indian Economic Association, from December 27-29, 2014. We also extend our greetings to welcome the esteemed Speakers, delegates and students to Udaipur and the Conference. There will be high expectations from the Speakers at the Conference, most of whom are renowned economists working at the highest echelons of the Government of India, World Bank and International Monetary Fund. As the nation is drawing up new strategies for economic development and growth, the ideas, concepts discussed and shared at the Conference will assume far greater importance, relevance and significance. The responsibility on economists and technocrats has never been greater to steer India towards all-round prosperity. India, in the second decade of the 21st century, stands at the cusp of history. It needs to draw inspiration from its rich historical past and draw road-maps for the future in sync with today’s opportunities and challenges. We hope, being in Rajasthan and Udaipur, some of the finest minds of the nation will think and plan for our today and tomorrows. We look forward to the Conference proceedings being shared in the public domain. It will be yet another achievement for the Department of Economics.